Select the file(s) containing your existing model and click import. Select your area of interest, then click the edit button next to the elevation layer you wish to edit. The selected dataset is in a non-meter-based projection. Please choose a projection to create the workspace in. You are able to verify the detected projection and no-data values before importing. Select a node to modify it. Click on a path to show its properties or modify it. Hold down the shift key to move the feature. Click to place each point on the path. Double click to place the last point. Once bound, a workspace cannot be unbound. After binding, your edits will be committed only to that edit set. If you do not want to commit your changes to that edit set after binding, the only other option is to delete the workspace (and all your edits) and start over. Click on a node/channel and then select any downstream node/channel in the network to display the profile between them. Add computation layers to study computed water heights. Click on the network to create a new cross section. Not implemented yet. Click on a node in the network to move it. Not implemented yet. Select a node to delete it. Not implemented yet. You can query, download and visualize the water depth in a depression. You can easily get the volume of a depression, and the water volume in the depression. You can view watersheds and flow for any amount of rain. More powerful watershed queries highlighting the downstream sink of the query point. The new flash flood map is available right now, but the old version will be available for a period to allow for a smooth transition. You can enable or disable the new flash flood map from your account settings. Water Flow: The terrain topography determines how surface water is transported to the ocean. Explore how water flows on the surface and forms flow networks, interactively choosing network detail. Sea-Level Rise: The terrain contains barriers to rising sea water, once water rises above these barriers there is a risk of flooding. Interactively select any possible sea level rise and see the effects. Watersheds: A point on the terrain surface can potentially receive surface water from a very large upstream area. 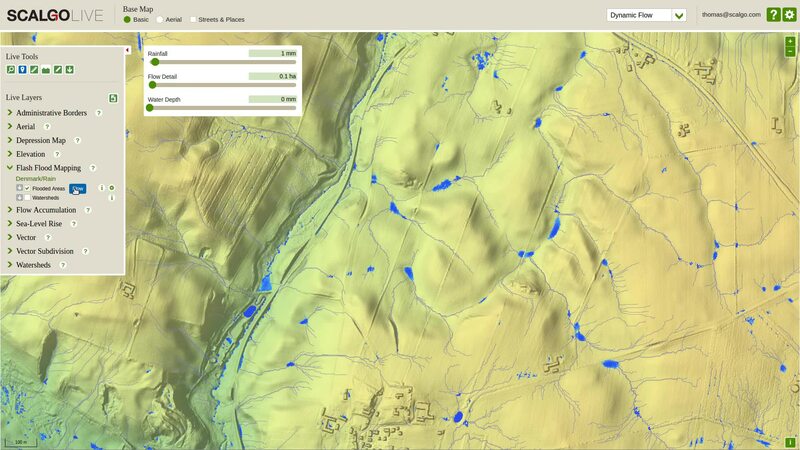 Interactively visualize the extent of the upstream area of any point. Combine: Customize your map with flow networks at desired detail, flooding from a given sea level rise, and combine with watersheds, topography, as well as street and place names. The surface of the Earth is our natural habitat. Its topography determines many things about our lives; where rivers form and where the sun shines, it decides what we can see and the routes we travel along. At SCALGO we work on analyzing huge digital representations of the Earth's surface — below and above sea level. We seek to extract information that can inform decision making processes and improve the understanding of our habitat. We do so by building on advanced algorithm technology, initially developed within leading US and European research institutions, and further developed and commercialized within SCALGO. We work closely with scientists, data providers and end users to develop groundbreaking analysis methods, and state-of-the-art algorithms that allow these methods to be applied on a regional, national or even global scale. SCALGO Live Global is our way of sharing global analysis with the community and the general public. This first version focuses very much on water flow and flood risk. Depending on feedback, we will be continuously adding new analysis and new innovative tools to SCALGO Live Global. This is made possible by the near-global digital elevation model SRTM, which is made freely available by NASA, as well as the hydrological modifications performed in the HydroSHEDS project by the WWF. The resolution of these data sets is three arc-seconds, or 90 meter at the equator. SCALGO also does a large range of commercial projects on high resolution (submeter) digital elevation models, even for very large areas (e.g. national scale). These enable a more detailed and precise analysis. Contact us or visit scalgo.com to learn more about SCALGO Live or our other products. Since the models have a resolution of 90 meter at the equator, geographic objects with a surface extent smaller than 90 m might not be captured in the data. This of course adversely influences the result of any analysis performed on the data, especially flood risk analysis since dikes and dams may not be captured in the model. This should be considered before applying the analysis results available on SCALGO Live Global. SCALGO cannot be held accountable for any damages that might occur as a result of using the analysis available on SCALGO Live Global.